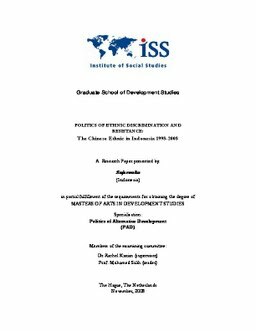 This paper explores the complexity of the Chinese discrimination issue in Indonesia, particularly from 1998 to 2008. What is now known as the Chinese discrimination in Indonesia is a result of a long lasting application of discriminative policies since Dutch colonial era to President Soeharto era in 1998. This paper explores how the Chinese react against discrimination both politically, based on social movement, identity, inclusion, and resistance theories. The forms of movement (through political party, through ethnic association, and through NGOs) are first examined. Then, the study explores the obstacles and opportunity of each movement, and how effective they are in order to fight against discrimination.